Since my first eBay transaction was a success, I became more confident doing my 2nd one, this time with eBay power seller Ann from Antipolo. After few email exchanges confirming my order, I deposited cash through BPI on Friday. The items where partially delivered on Sunday and the rest arrived Tuesday the following week since Ann had to wait for the gift bag to be completed. Prior to that, Ann & I were constantly texting updates and that gave me more assurance that I did the right choice. The whole process was pretty easy and salvaged a lot of time & effort compared to visiting Divisoria and wandering all over the place just to find cheap but nice stuff. 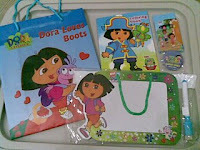 Now I got Dora gift bag, whiteboard with pen & eraser, coloring book, crayons and button pin, all from eBay.